When I resigned from my stable and regular job for 16 years I thought of investing my small earnings to a profitable business. I was thinking hard and getting advices from my former colleagues and family if I will put my money on business or buy some stocks. I have one business in mind and that’s our old meat products business. But since I’m too busy then it didn’t pushed through. Well many of the retired employees have switched to running small business because they think that it will help them somehow. Some of them invest on stocks but they’ve made sure that they study and learn about option trading before venturing in stocks business. The business can really give you some nice profitable income but you need proper training and advices from the experts in order to achieve that. Well there are many ways of investing your money but is sure to put it into a good investment program that promises high return of investment. We should always be aware of how we use our money because in this time of great economic crisis we need a lot of wise planning and budgeting. People who know how to handle money are the ones who become successful in their chosen field of investment. Start saving up money and look for better investments so you’ll have some financial backups when the going gets tough! For more photo hunt 'black' entries just click on the badge above. Looking good and wearing the right clothes is a must in every work industry we’re employed in. Employees should look the way they should be in whatever job they have. For those who are front-liners it’s a must that they look respectful but friendly enough for the customers. Dressing up to fit your work level is one trait that employees should learn. I had some hard time in the past with making our employees follow the rule of our dress code. I told them that they should wear polo, blouse or something office-like attire from Monday until Thursday and then on Friday they can be casual and wear anything they like. We don’t have uniform polo in our office so I just told them to wear appropriate clothes so we can all look respectful in our work. Some people just can’t follow but I know if they’re working in first class hotels they would be forced to wear their hotel uniforms because there are strict regulations there. They want their staff to look good because if the staff are nice and looks very good with their uniforms their clients will keep coming back. Well if you want your employees to look beautiful and very professional with their uniforms you can get ID by Landau's products. They offer quality uniforms for all types of work. 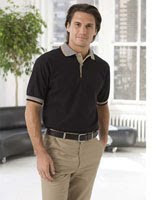 They also specialize in business uniforms and they have choices of clothes for different look you may need in your work. You can have casual or tailored look. Be assured that you’re getting quality, comfort and good fit in every ID by Landau’s products.